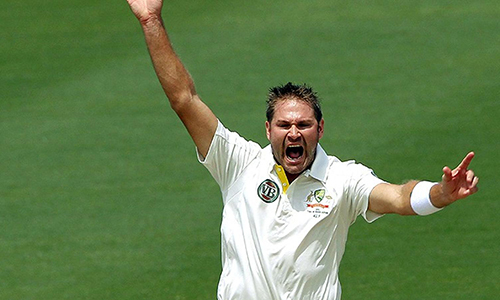 LONDON – Australia’s selectors may be spared the headache of choosing who to leave out of the team’s pace bowling unit for the first Ashes Test against England after Ryan Harris was withdrawn from a warmup match due to knee soreness. With fellow pacemen Mitchell Johnson, Mitchell Starc and Josh Hazlewood all bowling well, selectors are unlikely to risk Harris given his injury history and his usual need to ease his battle-scarred body gently into a series. Selectors may also be spared the difficult decision of picking an all-rounder, with Mitchell Marsh plundering 136 off Essex’s bowlers at Chelmsford on Wednesday. The century was the impressive 23-year-old’s second from the warmup matches, placing huge pressure on Shane Watson. Watson, long the incumbent, hardly disgraced himself with the bat, scoring 52 before being bowled by former Netherlands international Ryan ten Doeschate. But the 34-year-old’s second half-century of the tour was a reminder of his record of failing to convert starts into big scores and he is likely to need a fine bowling performance over the next three days in Chelmsford to hold onto his place. Australia, who won the last Ashes 5-0 on home soil, are bidding for their first series win in England since 2001.